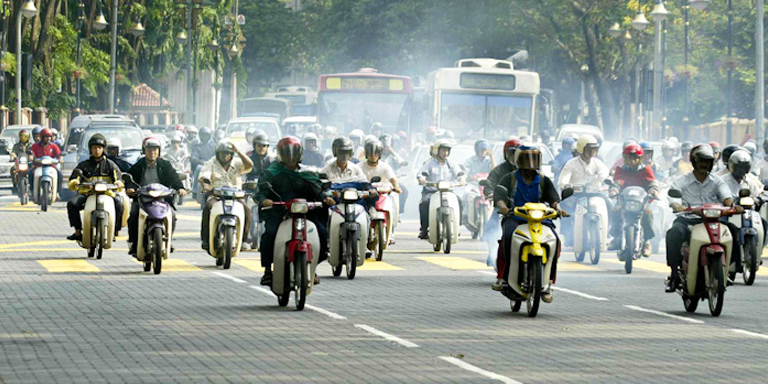 Motorcycle traffic in Kuala Lumpur, Malaysia. App-based motorcycle taxi services are one aspect of Southeast Asia’s digital transformation. Photo credit: ADB. There is a tremendous amount of excitement in Southeast Asia about the growth of the digital economy, considering the development of digital lifestyles, cashless societies, app-based businesses, smart nations and virtual services. The region is a hot spot for digital development, and it already leads the world in some indicators, such as Internet and social media use. The signs of Southeast Asia’s digital transformation are obvious from its impressive tech unicorn companies, such as Go-Jek, Grab, Lazada, Sea, Tokopedia and Traveloka, to the entrepreneurs and small firms that are innovating and using technology to grow. All of this is driving a high level of interest from the region’s governments, all of which are implementing various strategies to grow the digital economy. However, despite all this excitement, most businesses have yet to embrace digital strategies at the same high level of Internet use by the population. In other words, the full potential of technology as a driver of private-sector growth is not being realized. This is because the region still faces significant barriers to growing the digital economy. The first is to improve the availability of affordable, high-speed Internet. Around half of the population in the ASEAN region still lacks Internet access, and when available, it tends to be through mobile broadband (for example, using smartphones), rather than the fixed broadband needed for data-intensive business applications. Public and private investment is needed to address this, but policymakers can also help through regulatory reforms. In many countries, the broadband market is dominated by one or two large firms, and often these are state-owned. Reforms that promote competition could help lower prices and increase speeds. The second priority is to strengthen the population’s digital skills. Although the region already has good literacy and numeracy foundations, education systems need to be nimbler in developing the skills needed for the digital economy. These range from basic computer use to advanced skills, such as coding and data analytics, as well as soft skills such as collaboration and communication. Achieving this requires a focus on lifelong learning—not necessarily acquiring specific degrees, but developing skills for life. Singapore’s SkillsFuture initiative, which provides resources for ongoing retraining and skills development, is one example. Third, expanding the use of digital payments is an essential part of a digital economy. The latest World Bank Global Findex data shows that only 19 percent of financial account holders in the region access their accounts using a mobile phone or the Internet. This is well below the average of the world’s middle-income countries (27 percent) and sub-Saharan Africa (24 percent). Governments can help by putting the appropriate regulatory infrastructure in place and by using digital payments in their interactions with citizens—such as paying for government services or receiving pensions. Likewise, government-run digital ID schemes can help citizens gain account access more easily. The fourth barrier, especially for e-commerce, is high-cost and unpredictable logistics. It is, therefore, imperative that countries in the region address high-cost and unpredictable logistics. The challenging geography of many Southeast Asian countries is an important factor, but regulation also plays a role. A recent World Bank-ASEAN report showed that logistics barriers to cross-border trade in the bloc are among the highest in the world. E-commerce shipments face unpredictable customs procedures in many countries. The World Bank Logistics Performance Index shows that customs is the weakest area of performance across the region’s logistics environment. Fifth, policies that promote trust are essential for growing participation in the digital economy. These cover a range of areas from data privacy to cybersecurity, to consumer protection. Fewer than half of ASEAN countries have comprehensive data protection laws, and the capacity of data protection authorities remains limited. Additionally, policies are not coordinated regionally, making it hard for individuals and businesses alike to know what regulations apply when their data moves across borders. Finally, governments need to lead by example and become more digital themselves. This means streamlining systems on an integrated “whole of government” basis, but also offering digital services platforms that support businesses and reduce transaction times and costs, such as online licensing and permit approvals. Initiatives such as national digital ID can trigger direct benefits in other areas of the digital economy—such as the previously mentioned digital payments example. Other policy areas, such as taxation, are also important for governments in growing the digital economy and managing its risks. But by building these six critical foundations for the digital economy, boosting the region’s capacity and brokering technology to solve its development problems, Southeast Asian countries will be better positioned to unlock the full potential of the digital economy across the region. Victoria Kwakwa is the World Bank’s vice president for the East Asia and Pacific, overseeing a portfolio of more than $32 billion in loans, grants, credits, and trust funds across 23 countries. Ms. Kwakwa leads the World Bank’s strategy in East Asia Pacific which focuses on: inclusion and empowerment; jobs and private sector-led growth, governance and institutions, infrastructure and urbanization, climate change and disaster risk management, as well as the cross-cutting themes of gender, fragility and conflict, and poverty analytics.